Karen Hough is the Founder and CEO of ImprovEdge, LLC. This business training with an improv twist allows people to have fun, while learning to better negotiate, communicate, collaborate, change, present, inspire, and lead. “At ImprovEdge, we passionately believe that improv can help teams, companies, and individuals be more successful, more adaptable, and more effective at anything,” explains Hough. After a career as a professional improviser and actress, Hough jumped into start-ups in the network engineering space. And in 1998, Wharton School of Business let Hough and her partners pilot a workshop with their MBA students. 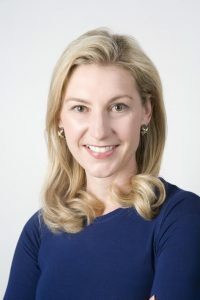 To this day, Hough and her partners continue to test the material with MBA programs around the country and use the research of neuroscience and psychology to back up their findings. “The amazing thing about this technique is that it is disarming. People will feel heard, valued, and they will enter into collaboration instead of confrontation,” explains Hough. If you want to hear more from Hough, she’ll be speaking at the Association of Change Management Professionals Conference in March 2018. Or check out her books (available at booksellers and Amazon) about using improvisation to be more effective at what you do every day. 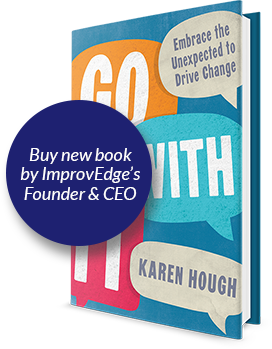 Hough’s latest book, Go With It: Embrace the Unexpected to Drive Change, is available on Amazon. Learn more about ImprovEdge by visiting them online www.improvedge.com or following along on Facebook and Twitter: @ImprovEdge. You can also learn more about Karen Hough by visiting her LinkedIn and following her Twitter: @KarenHough.